Soak rajma overnight in water. Pressure-cook it for 3 whistles and keep it aside. Heat oil in a deep-pan and add cumin seeds, hing into it. Once it crackles, add ginger-garlic paste and onions. Saute it for around 30 seconds. Add chopped tomatoes and cook again for a min. Add cooked rajma, curd and all the spices into it. Mix everything well. Cook it for 3-4 mins. Make sure it’s not mashed at all. 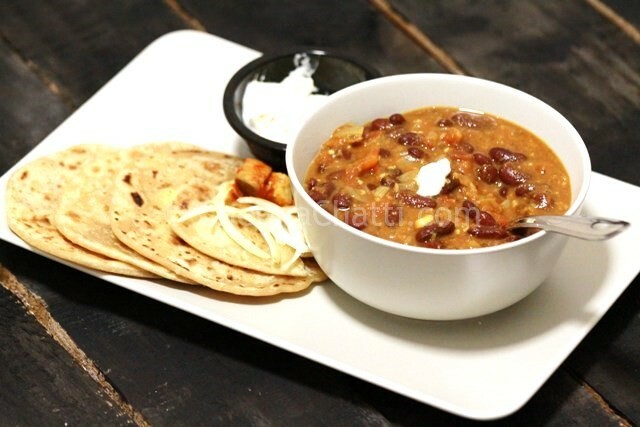 This entry was added on October 4th, 2013 by SJ in Gravies and Curries and tagged with north indian, vegetarian, north indian curries, malai rajma, how to make malai rajma. Last revised on April 4th, 2018.